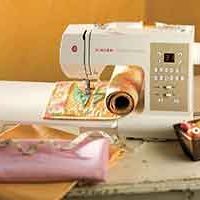 The Brother PQ1500S High-Speed Quilting and Sewing Machine is a domestic quilting sewing machine suitable for beginners and experienced quilters. With an array of functions and the fabulous price point, it would make a great addition to your sewing room. This sewing machine is a good machine for tackling your quilting projects and is great for larger quilts with the large throat space. 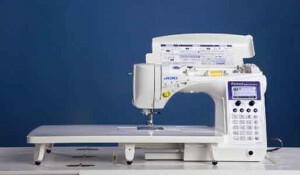 It’s has a high-speed straight stitching function sewing up to 1,500 stitches per minute! What are the things to take into account when you’re looking for a sewing machine for quilting? Choosing a machine for quilting is a much different proposition than choosing one for basic occasional use. If you’re on a limited budget it’s more important to have a reliable machine that sews well than have extra bells and whistles on an unreliable one. A good straight stitch – essential when piecing fabric together. The option to disengage feed dogs – needed for free motion quilting. Variety of feet – these add extra functionality and a walking foot is a must for moving the 3 layers through evenly. Throat space – this is the space on the right of the needle where your quilt will get shoved through during quilting, the bigger the better! 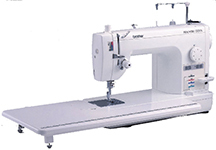 Variable speed motor – helps to give good control when free motion quilting. Extension table – to the left of the needle for those larger quilts. Marked measurements on the needle plate – this makes it much easier to achieve accurate 1/4″ seams. Build quality – it’s important to check this. Sewing quilts puts a heavy strain on any machine, a flimsy plasticky machine won’t last long. Lighting – look for sewing machines with more than one light that are angled well onto the work surface. Bright LED lights are the best. Instructions – are they easy to follow and does the machine come with a DVD?